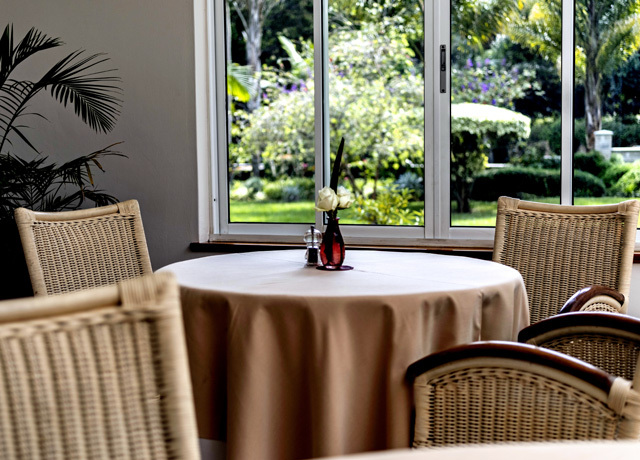 Located on 2.5 acres of beautifully manicured gardens in the quiet residential suburb of Karen on the outskirts of Nairobi, the House of Waine offers an appealing alternative to standardized city hotels. Our luxury mobile tented camp on a private conservancy in the Maasai Mara offers the ultimate in proximity to wildlife without the crowds—plus opportunities for night drives and bush walks. To sleep beneath canvas in the bush, under a Milky Way so thick with stars that it looks like clouds, listening for the roar of lions in the distance…there’s no more iconic safari experience! 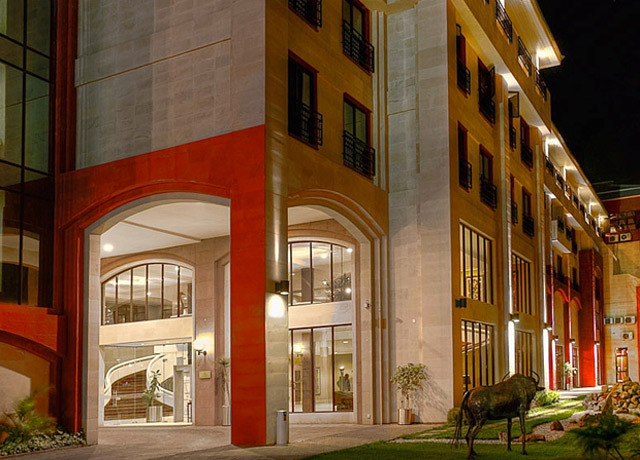 Ideally located between Nairobi's domestic and international airports (the latter is less than 15 minutes away), Ole Sereni also offers a taste of wild Kenya, bordering Nairobi National Park. 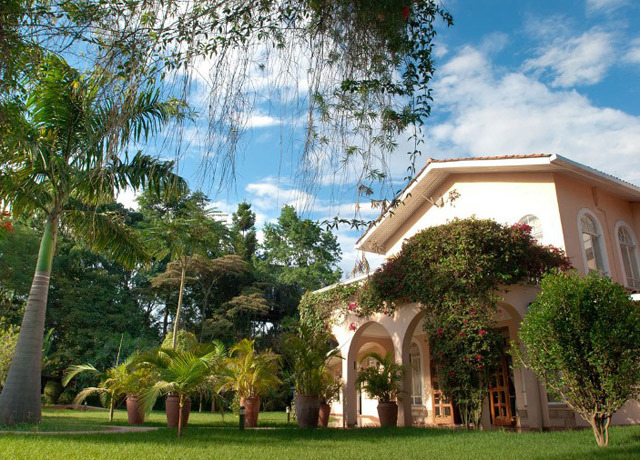 The House of Waine, located in the quiet residential suburb of Karen on the outskirts of Nairobi, offers an appealing alternative to standardized city hotels. Set on 2.5 beautifully manicured acres, it was originally built as a lavish private estate. Later acquired by a local family, the elegant property was carefully refurbished, resulting in the distinctive boutique hotel that exists today. 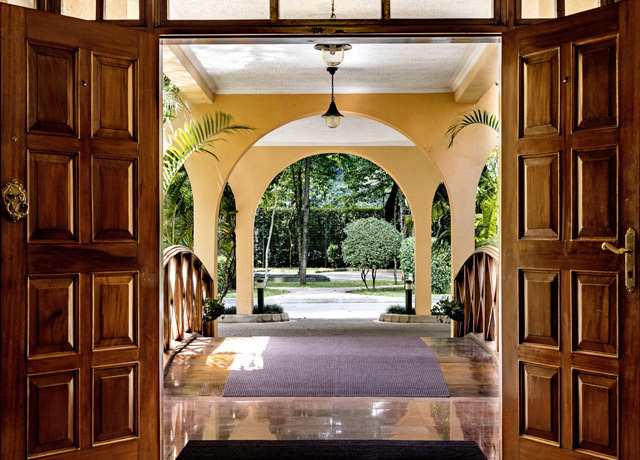 The stately home offers guests an authentic experience of personalized African hospitality with uniquely designed rooms, modern amenities and traditional Kenyan charm. The inn's 11 bedrooms are individually styled and named, each furnished to reflect a distinct theme. Complimentary pastries and fresh-ground coffee are delivered to your room daily. Luxurious en suite marble bathrooms feature large windows and natural light. All rooms have mini bar and Internet access. The House of Waine’s dining menus reflect Nairobi’s many local flavors. Meals are served in multiple locations including the dining room, terrace, garden, lounge and pool pavilion, offering memorable dining experiences amid the verdant lawns and gardens. Guests can also relax on the spacious patio and enjoy drinks poolside. The House of Waine is an easy 30-minute transfer from Jomo Kenyatta International Airport and 20 minutes from Nairobi's domestic Wilson Airport. 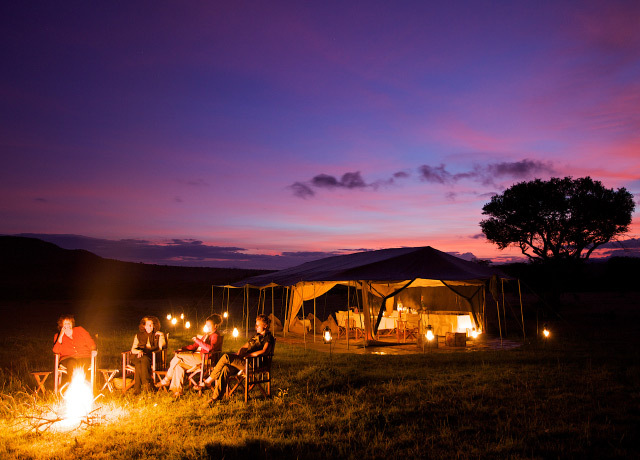 Our luxury mobile tented camp is the perfect base for wilderness family adventures. Situated in a remote location on a private conservancy in the Maasai Mara adjacent to the national reserve, it offers outstanding proximity to prime wildlife viewing without the crowds. Each tent has a shaded veranda with table and comfortable chairs. Inside the heavy-duty canvas walls you'll find shelves, luggage racks and hanging caddies for your personal items. At night, sink into cotton linens, duvets and blankets to ward off the chill, with the added comfort of a hot water bottle provided each evening. 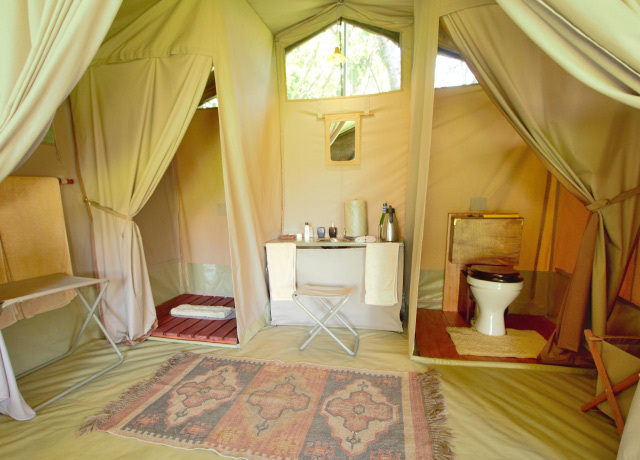 En suite bathrooms have flush toilet, sink, warm water dispenser and safari-style hot showers. Solar-powered lighting is available around the clock in each tent, with charging facilities for all your electronic needs in the main lounge. After sunset, camp paths are illuminated by kerosene lanterns. 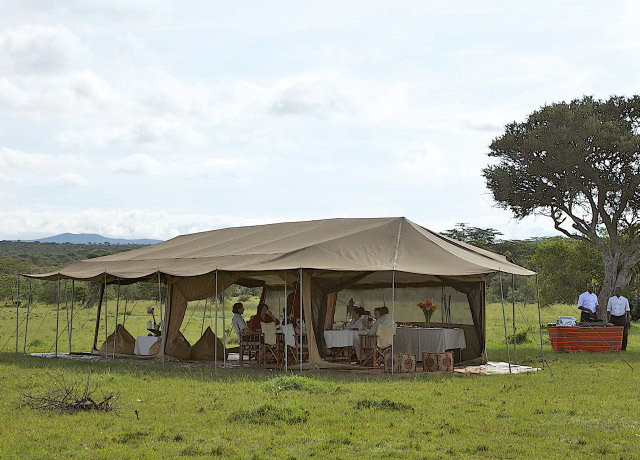 Fine meals are served in the dining tent or outdoors under the shade of an acacia tree. A separate lounge tent offers comfortable furnishings so guests can sink back and share stories of the day. Once darkness falls, gather round the campfire and listen for the the roar of a lion while the Milky Way puts on a bedtime show. To sleep beneath canvas in the bush, under a Milky Way so thick with stars that it looks like clouds, listening for the roar of lions in the distance… there’s no more iconic safari experience! 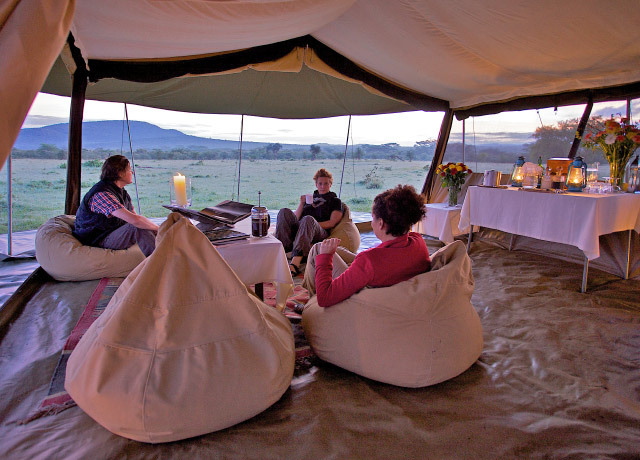 Yet while a remote tented camp may evoke the classic ambience of old, it doesn’t mean you sacrifice modern-day comforts. 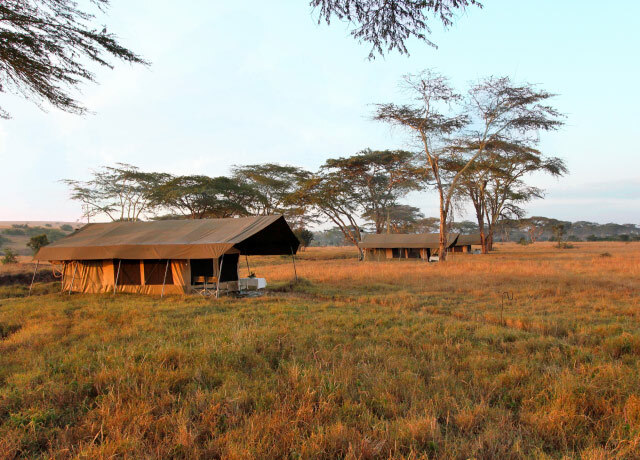 Natural Habitat's Migration Base Camp in the Maasai Mara is a most refined way to experience the African wilderness. 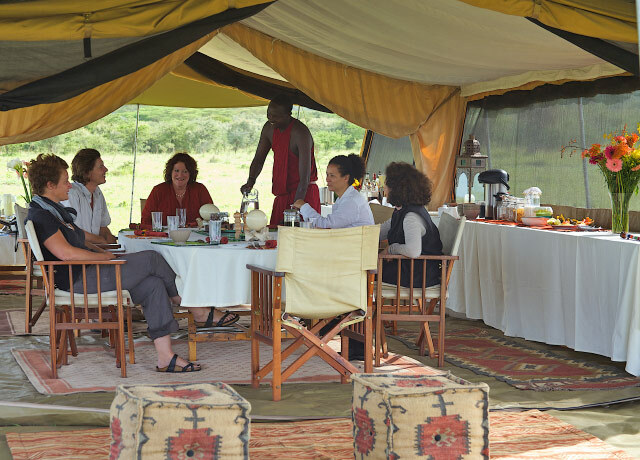 We place the camp in the best wildlife-viewing areas, where seclusion amid raw nature prevails. 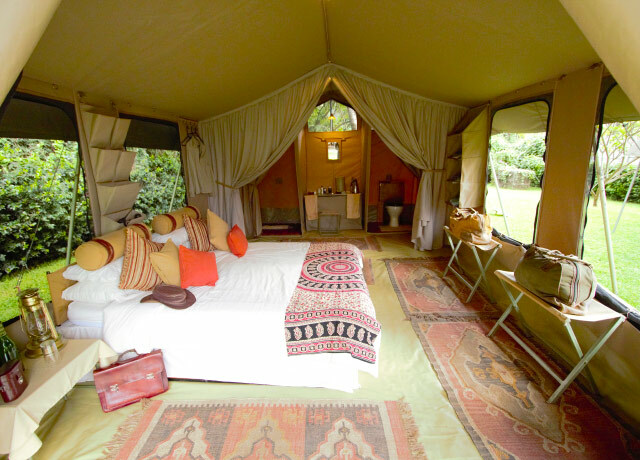 Inside the deluxe tents, however, you’ll find full beds with quality bedding and attached en suite bathrooms—surprising comfort and privacy—and your own veranda with director’s chairs out front, shaded beneath a canvas awning. Kerosene lanterns lend an atmospheric glow at night. Evenings in camp are magical, with dinner served on a white tablecloth under the stars, and nightcaps around a roaring fire. 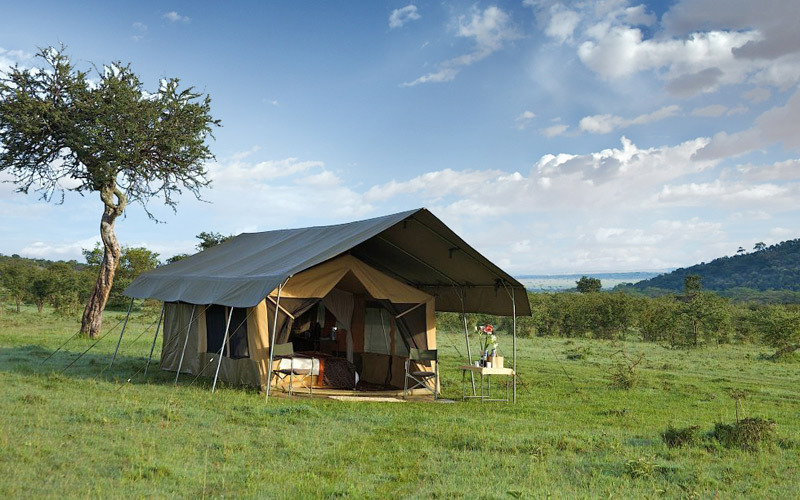 If you want a safari straight 'Out of Africa,' you'll find it at our Migration Base Camp in the Mara. Our remote setting means we are far from tourist crowds, and we follow animals on our wildlife drives, not other Land Rovers. The Maasai Mara's herds and predators are legendary, and rightly so: perhaps Africa’s most famous safari destination, this vast tract of savanna in southwest Kenya is known for its great wildebeest migration, abundant lions and the rich culture of the Maasai people, traditional pastoral herders who have grazed cattle here for centuries. The Maasai Mara National Reserve is the northern part of Tanzania’s vast Serengeti ecosystem, centered on the Mara River, the lifeline for the region. The reserve’s 580 square miles are home to nearly 100 species of mammals and 570 recorded bird species, making wildlife viewing here impressive at any time of year. The migration, of course, is incomparable, when nearly two million wildebeest, zebra and Thomson’s gazelle move in long, flowing columns across the plains toward the new grass that comes with the rains. There is also a chance to see the classic Big Five—elephant, rhino, buffalo, lion and leopard. Cheetah, giraffe and varied antelope are also common sights. 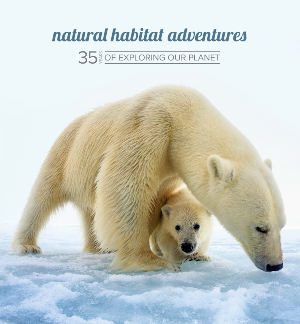 Conservation of wildlife and the environment in Africa never happens apart from the people who live in and near fragile areas that need protection. In addition to supporting communities by virtue of our safaris, which offer direct economic benefit through our hiring of local staff and the purchase of local goods and supplies in the communities proximate to where we travel, our Natural Habitat Migration Base Camp also supports other regional projects to sustain local people and the environment. Ideally located between Nairobi's domestic Wilson Airport and Jomo Kenyatta International Airport (the latter is less than 15 minutes' drive), Ole Sereni also offers a taste of wild Kenya, overlooking the bushlands of Nairobi National Park. Hotel guests frequently see giraffe, zebra, antelope and buffalo lounging near the nearby waterhole. 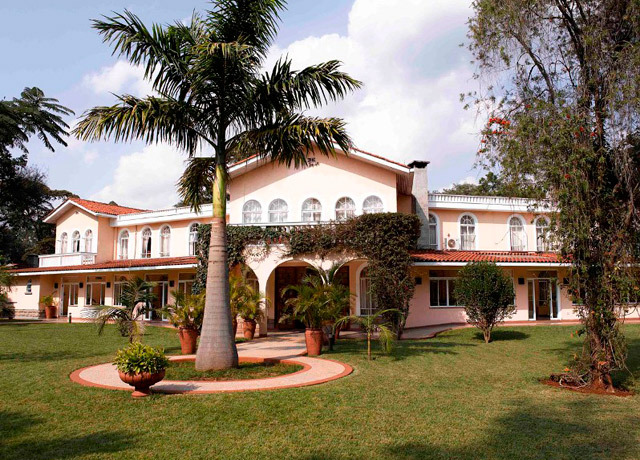 This business-style hotel offers all the conveniences one might need upon arriving in Kenya or before flying home. Each en suite room is equipped with the most modern amenities, with complimentary Wi-Fi, well-lit desk, LCD flat screen TV and mini bar. The Big Five Restaurant offers a 300-foot-long veranda with a view onto Nairobi National Park. The Waterhole Snack Bar hosts the same vista, while Eagle's is a fine-dining steak house on the fourth floor. Relax with a drink at the Ngong Pool Bar after a swim in the infinity pool. The Duma Health and Fitness Club features a full gym, salon, steam room and sauna, as well as massage facilities. Fill out the form below to receive additional information about our The Great Kenya Migration Safari or give us a call at 800-543-8917.